Bleaching is an age-old treatment whose time has finally come. Although this is the first textbook devoted to bleaching of teeth, the technique has nevertheless been performed over a century. It is one of the best documentated clinical techniques in dentistry and yet for reasons unknown, it has escaped the acceptance it deserves. The current trend toward cosmetic dentistry has generated more interest in bleaching as patients are asking for whiter and more beautiful teeth. Our society tends to dislike the yellowing of teeth that comes with age or the various intrinsic stains that occur developmentally. This is where the new market for bleaching will be during the 1990s. There is now little reason to accept discolored teeth when bleaching, in conjunction with other cosmetic dental techniques, is now readily available. 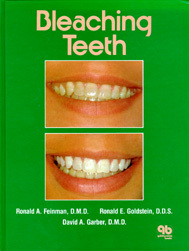 This book has a format that assists not only the dentist, but auxiliary personnel and patients as well. It will teach and assist patients when they require a more detailed understanding of the techniques involved, and as such should be a valuable adjunct to every practice.